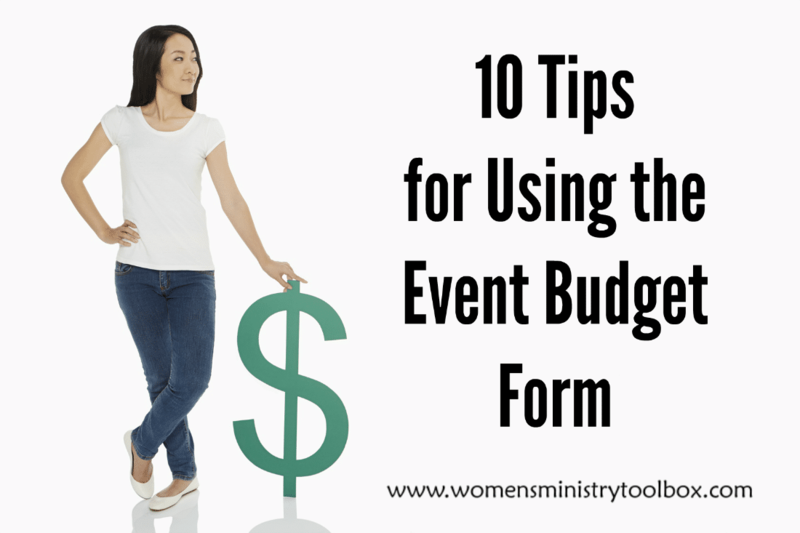 Does your team struggle with budgeting for an event? Perhaps you’ve under or overshot your budget on multiple occassions. Maybe budgeting for a ministry event is an area where you or your team could use some training. Help is here! Today I’m sharing a free printable Event Budget form with you. The first time I transitioned from serving on the women’s ministry team in one church to serving in another I learned quickly that every church has their own way of doing things. While I might have had to fill out a form in one church, another church just required an email or a phone call. One of the most useful forms I’ve come across, having served in three different churches, was the Special Event/Project Budgeting Sheet from our church in Apex, NC. Once a year as we submitted our budget requests, we had to complete the Special Event/Project Budgeting Sheet. The sheet was to be filled out for every event, activity, or project we were going to put on our calendar during the next fiscal year. It’s a detailed sheet that forced our team to get specific about our budget request. If we wanted budgeted money we had to show on paper how it would be used. In cases where we were going to host a zero budget event (where you charge a fee to balance out the cost) we had to put that on paper too. Thinking through the nitty gritty details helped to ensure we didn’t overlook a large expense or a bunch of smaller ones. Knowing how helpful it was for our team, I’ve tweaked and recreated this form for you to use. 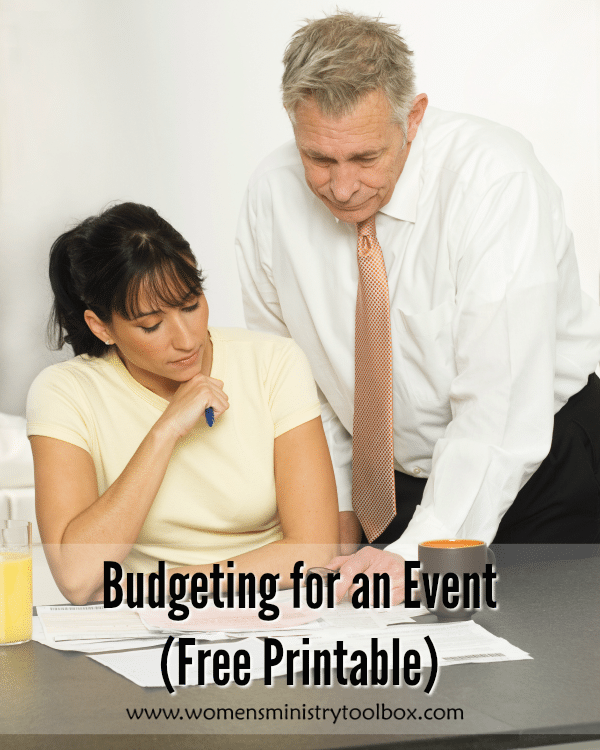 You’ll find a free PDF file of the Event Budget Form at the bottom of this post. 1. If your expenses do not equal the amount you’ve budgeted for the event, you’re going to need to charge a fee, fundraise, or secure donations. Talk to your Pastor about what is appropriate at your church. 2. If your ministry has no budget (I know that’s the case for a lot of smaller churches) hold your planning team accountable for taking every expense into consideration so no one spends money out of their own pocket to cover the cost. 3. Many of the items may not apply to smaller events. Just leave them blank and move on. 4. Utilize the empty spaces for expenses not already listed or place them in the miscellaneous category. 5. Submit a copy to your pastor and/or Finance Committee along with your annual budget request. Keep a copy for yourself and team leaders in your women’s ministry binders. 6. Consider adding a small miscellaneous line item to cover large events such as a retreat or conference. There’s a bigger chance you’ll underestimate or forget a necessary expense. 7. Allow the team flexibility to move money from one category to another if everyone is in agreement when the planning begins in earnest. You might stumble upon an amazing item for the retreat goodie bags that costs $1/per person that the team is willing to purchase if another line item is decreased to make up the increased cost. 8. Keep copies for future planning purposes. It’s a lot easier to pull out a retreat budget from two years ago and tweak it than to create one again from scratch. At the same time attach any notes or a copy of your Post Event Evaluation Form that will be of assistance in the future. You may discover you greatly over or underestimated an item or two. 9. Don’t forget your servers and childcare volunteers. If you’re hosting an event during a mealtime you’ll need to clearly communicate if you are providing a meal or not. 10. Encourage your team to get creative if costs are becoming prohibitive. It doesn’t mean God doesn’t want your team to move forward, it just means you may need to move in a way not expected. For example, let’s say your childcare costs are going to be a deal breaker, see if you can get the Youth department to serve in return for donations toward their next mission trip or summer camp. Here’s the revamped version of that original form. Feel free to print it and use it as is, or tweak it as needed for your ministry. I hope you’ll find it to be useful as you pray and plan for your upcoming women’s ministry events. Is your event budget realistic? Thank you for your very helpful, free informational website. We are a small upstarting church we are in our 4th year. We have a small Women’s Ministry but the Lord has blessed use by giving us the means to host several conferences via telecast of Beth Moor and Shiela Walsh. We are striving to do more of these as well our church reaching out to our small community with a yearly holiday and summer feast. We know that he will equip us for what we need as long as we do it in obedience and listen for his voice. Thank you for making your information available to help equip the saints with the information needed. May God bless you in all areas of your life and ministry. Thank you for your very helpful, free tips. We are a church plant and as of yet have no women’s ministry. I feel God has chosen me, a non-organized person, to start one. We know he equips the called, so thank you very much for your obedience to God in making this good information available and free!